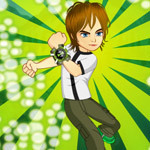 Free to Play Ben 10 Power Shot, start your free game now (2016). Description: Collect Power watch to increase laser counts. Laser counts will increase your shooting counts. Attack enemy (Vil gax) to score points. Complete all levels with given target score.